For my signature appetizer I chose Tapenade. Tapenade, for those who like me are not a ‘foodie’ but aspire to be, is a blend of olives. Some tapenades are coarse or fine. The one I chose for this night was finely chopped so it almost looks like caviar. It has a strong taste so I love to combine it with some other fun stuff. 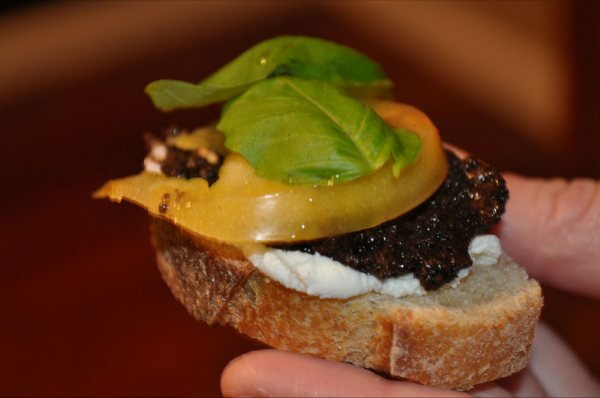 First I take a slice of baguette bread, spread a layer of goat cheese, then the tapenade, put a slice of tomato, and topped with a basil leaf. You can dress it up or down depending on how much time you have. You could chop up the basil, toast the bread, or drizzle vinaigrette over the tomatoes. Tapenade is one of my favorites because it's like a sandwich bar and you can omit things you don't like or add more of something. It also only takes a few minutes of prep time and no cooking, which I love. Although Jen will tell you I needed quite a bit of help New Year's Eve while prepping. I managed to knock over a glass of water on to the bread I was cutting which had to go in the garbage. Thank goodness we had a backup loaf and Jen to get me through to the end. 1. Bring water and sugar to a boil in a small saucepan over medium high heat until sugar dissolves. Cool. 2. Stir tequila, juices, syrup and blue curaco in a large pitcher with ice. Garnish with orange slices. Serve straight up or over ice in glasses rimmed with salt. Your appetizer is so pretty and you gotta love easy, yet so so so delicious! Your drinks sounds great too, I can't wait to see the picture! It's only 8 am and I am craving this. That picture really sells it girl. Nice work.